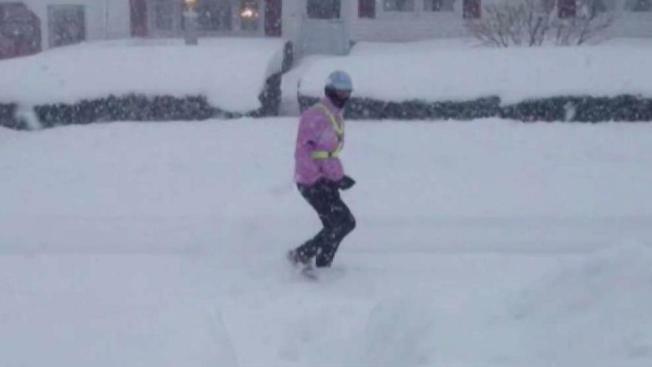 Beth Whipple has run through the heat, the rain and record-breaking snowfall. A New Hampshire woman who has run every single day for nearly three years will finally take a day off. For the first time in almost three years, a New Hampshire woman is going to take a day off from running on Saturday. NBC Boston caught up with Beth Whipple along her 18-mile run Friday in Nashua to find out why and how she did it. "There's just that invincible thing, like I can do anything," Whipple said about running. It's that runners high that keep her going - and she's been going for more than 1,000 days. "One thousand and two," Whipple said, to be exact. Just after Christmas of 2014, Whipple set a goal to run at least one mile every day of 2015. "Then 2016 came and I kept going, and 2017 came along and I just kept going," she said, laughing. Whipple has run through the heat, the rain and record-breaking snowfall. Her friends vouched for her. "Some of the elements she ran in, I thought she was nuts," said runner Kate Von Pichl. "That's what makes her so special to us." Though they weren't always easy, Whipple's logged more than 6,000 miles and sent a poignant message with every step. "Absolutely inspire and motivate people to get out and do something," said her friend, Amanda McCann. "Do something that betters you, betters your life, or makes you happy, makes you smile, because that's what living is about," Von Pichl said. Back in 2013, Whipple was a block and a half away when bombs exploded at the Boston Marathon finish line. So today, she runs with a different perspective. "Just grateful, just being grateful that I'm able to run," Whipple said. "I really love to run." But on Saturday, she'll stop. "I'm taking tomorrow off," she said. She's breaking a nearly-three-year long running streak but only to regroup before a race on Sunday. "You would be surprised at what you could do," Whipple said. "I didn't think that I could do it." She's run the Boston marathon the last two years and is anxiously waiting to find out if she qualified for next year. She says Boston is the most meaningful race she'll ever run.